Why buy party nuts when you can make your own? 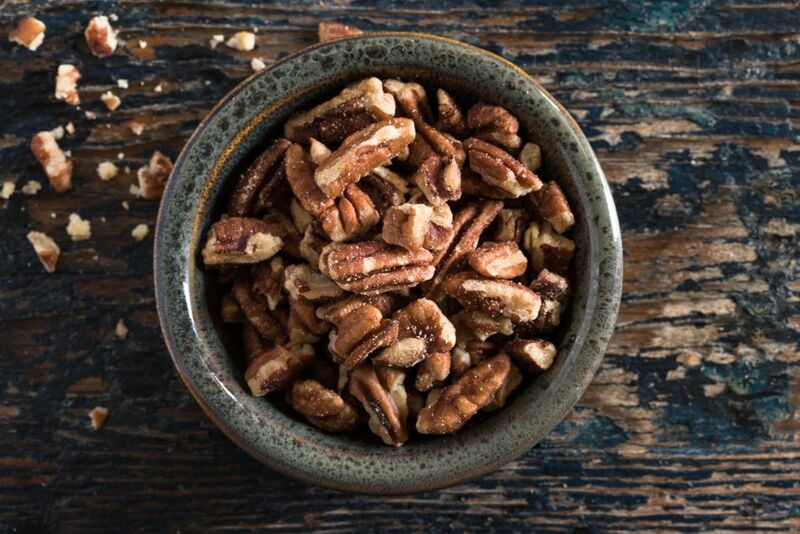 Use your favorite seasoning combination, along with butter, to make this easy roasted pecan snack. The nuts can be served as a party bite or be packaged up and given as gifts. Bundle them up in colored cellophane wrap tied with bows and place them in mugs, or simply pour the nuts into decorative small jelly jars. For this recipe, you can choose a store-bought seasoning mix or create your own. Almost any seasoned salt blend will work. If you like a little spice, try a Cajun seasoning. It's also easy to make a blend of common ingredients like salt, black pepper, onion powder, and garlic powder, or whatever you have in the spice rack. In a large, shallow roasting pan, combine the melted butter and pecans. Roast in the oven for 15 minutes, stirring from time to time. Sprinkle with the seasoning and toast for about 15 minutes longer, stirring occasionally. Cool thoroughly. Pack in airtight containers and store in a cool, dry place for up to 1 month. If you prefer, these nuts can be made in the slow cooker. Simply combine the ingredients, cover, and cook on high for 15 minutes. Turn the cooker down to low and cook uncovered for an additional 2 hours, stirring occasionally. Almost any herbs and spices can be combined to create your very own seasoning blend. It's something you can make for a single batch of these snack nuts and give each batch a new twist. Once you find a personal favorite, mix up a larger amount of the seasoning. Store it with your spices so you can make these nuts whenever you like. There are many ways you can spruce up nuts at home. While you're in the mood for some nutty goodness, give a few other recipes a try. You can even do up a couple different nut blends to complete a gift basket or offer your guests options at a party. For instance, for a sweet nut to contrast the spiced pecans, try glazed pecans. These are cooked in a brown sugar syrup, creating a delicious and crunchy treat. Over the holidays, candied pecans are the way to go, bringing in the extra flavors of cinnamon and vanilla. There's no need to stick with just one nut, either. You can use mixed nuts for any of these recipes. The savory spiced nuts recipe, for example, relies on pecans, almonds, and peanuts. Seasoned with chili powder, garlic salt, and cayenne, it's fantastic.